The first 2 products are up on Amazon – Monkeys medium and large size. 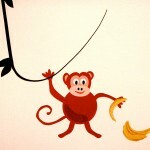 The big chimps are cool – those guys are 14″ x 11″ each – you can do a really cool mural or decoration with them. Thanks to Leanne for recommending to go BIG. So there are 2 sizes offered. We shall see how they go! Stay tuned for Fairies, Flowers, and Cherry Blossoms – to be available soon!